WPW041264 WALES (1933). 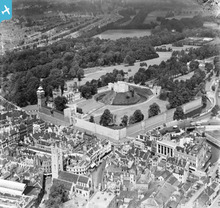 View of Cardiff Castle with St John the Baptist church, oblique aerial view. 5"x4" black and white glass plate negative. 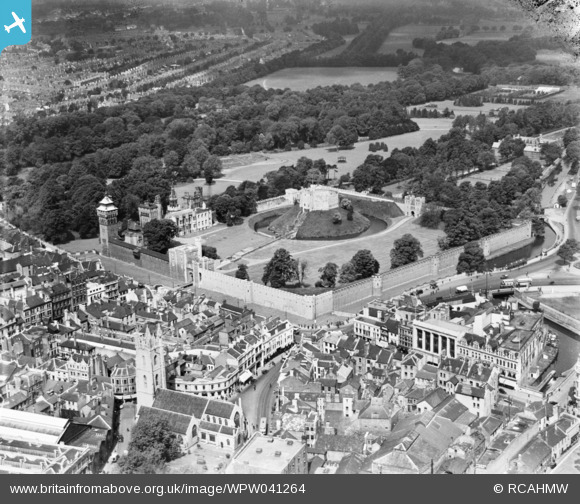 Title [WPW041264] View of Cardiff Castle with St John the Baptist church, oblique aerial view. 5"x4" black and white glass plate negative. Crockherbtown Lock, Lock 50 of Glamorganshire Canal. Alongside is the boat dock which from 1850 to 1894 housed a working boat weighing machine. Originally erected at Tongwynlais in the 1830s it was later moved to a site near the castle, where it survived until Cardiff Corporation donated it for preservation in 1955. More Working Street, urely ? Canal can still be seen emerging from tunnel under Queen Street.